Geographic distribution. Worldwide in distribution. Most commonly found in sheep and cattle-raising countries. Infection rate. Less than 20 cases of human infections (including an indigenous case) were reported in Korea. Recent infection rate of livestocks is not available. Life cycle. Human harbors the larval forms only. The adult worms infect the intestine of dog or caniids. When the eggs are ingested by the intermediate hosts, i.e., sheeps, domestic animals, or humans, embryos are hatched out in the duodenum, spread over the whole body to form hydatid cysts. The fully developed hydatids are capable of growing into adult worms in the definitive hosts. Morphology. The adult tapeworms are minute, measuring 3 to 6 mm in length. The size of eggs are about 35 ㎛ in diameter. The oncosphere metamorphoses into a unilocular hydatid cyst containing protoscolices oe free hydatid sands in the intermediate hosts. Pathology and clinical symptoms. 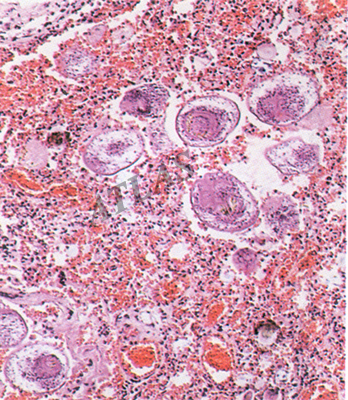 The larval tapeworm of E. granulosus causes unilocular hydatid disease in humans. Brood capsules sprout from the germinal layer and finally transformed into a vesicle containing scolices and free 'hydatid sands'. The liver is the most commonly involved organ. The chief clinical manifestations are pressure symptoms and anaphylactic symptoms with localized or generalized secondary hydatidosis. Diagnosis. Radiological studies, immunoelectrophoresis for the arc 5, or ELISA are useful. Prevention. Deworming of dogs and personal hygiene. 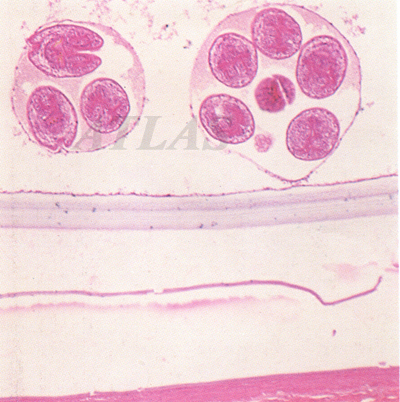 Hydatid cyst of Echinococcus granulosus demonstrates the three layers of the cyst wall and 2 brood capsules containing multiple protoscoleces. (H&E, 400x). 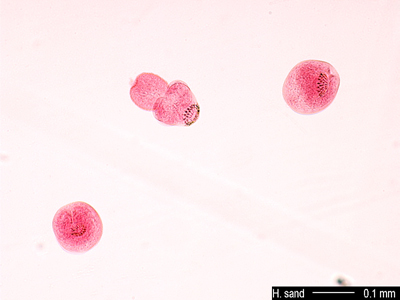 Adult of Echinococcus granulosus showing a scolex and 3 proglottids (immature, mature and gravid)(Carmine stain). 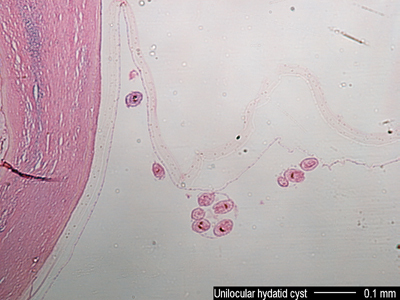 Hydatid capsule, inner surface, isolated from lung of a Korean woman (original cyst: 4*3*3cm). 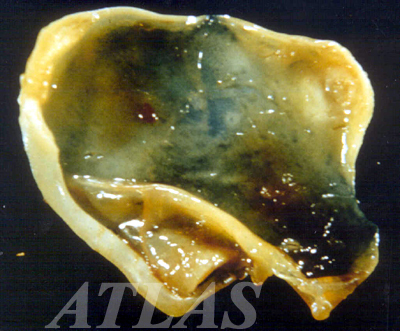 Hydatid sands in human lung. H&E, X40. 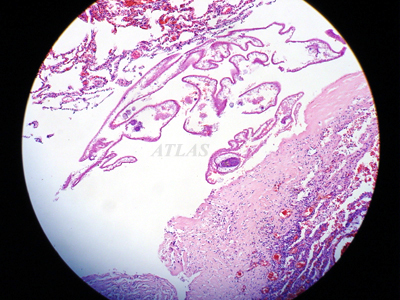 Hydatid sand in human lung. H&E, X100. 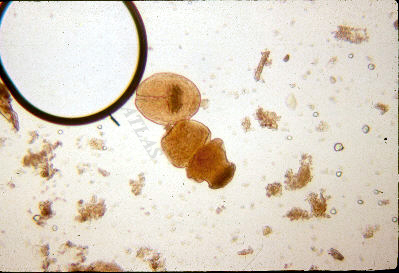 Hydatid capsule, inner surface, isolated from lung of a Korean woman (original cyst: 5X4X3cm). 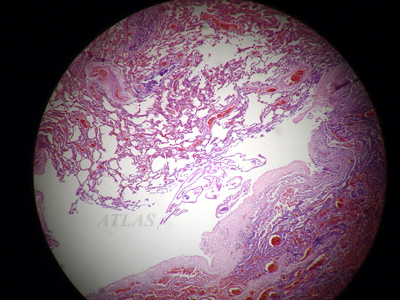 A section of human lung shows multiple protoscoleces liberated from a ruptured hydatid cyst (H&E, 400x). 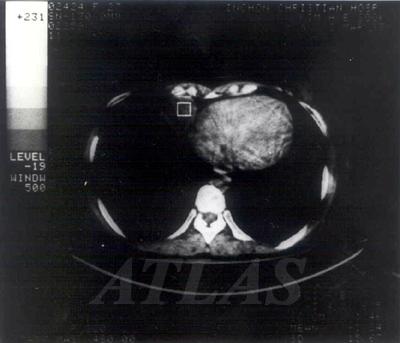 CT finding of hydatid cyst in human lung shows a distinct cyst wall and a clear fluid in the cyst. Chest P-A. 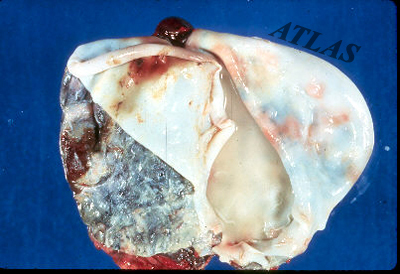 Hydatid cysts in human lung. Two mass shadows are indicated by arrows. 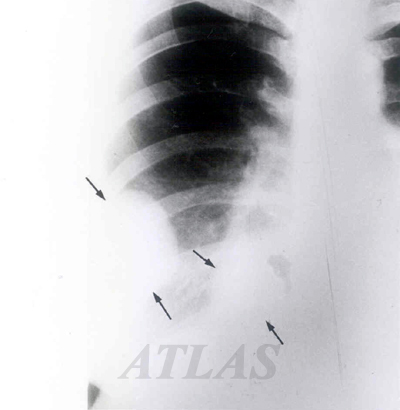 Hydatid sands from lung cyst of a Korean woman. X100.